I grew up here in Kansas City, just a few blocks from Troost Avenue. For my entire life, Troost has been an ugly dividing line — both physically and psychologically — between black and white. Politicians, ministers and civic leaders have forever implored employers and developers to invest along the Troost corridor. For decades, middle-class residents have been abandoning Troost and the urban core for the greener pastures of the suburbs. The population along Troost plummeted. Businesses, churches and schools closed in staggering numbers. The area became a desolate urban wasteland. Over the last couple years, however, several pioneering developers have made the bold decision to risk their capital and build new apartments along the Troost corridor. We are witnessing some of the first new construction on Troost in our lifetime. Most exciting of all (to me, at least) is that a new generation is not only willing to move there, but they’re excited to be part of a 21st-century urban environment where black and white Kansas Citians (along with Hispanics, Asians and maybe even millennials who grew up in Johnson County) can all live together without regard to the racial hang-ups that seemed so big to previous generations. Maybe Kansas City can show America how to heal the wounds that have divided us for too long. These new developments are not just building a bridge across Troost. They are weaving a new urban quilt that earlier generations could never have imagined. Granted, we have a long, long way to go. But this seems to be a very promising beginning. So why does The Kansas City Star’s editorial board see only the manure and not the pony in the barn? Its recent editorial rebuking the “Denverization of Kansas City” completely misses the mark. Yes, we need more affordable housing. But first we need to restore the urban population that we have lost over the last 50 years. “Gentrification” is the dirty new buzzword among those for whom the perfect is the enemy of the good. In order for our urban core to thrive, we need to increase population density. We need to replace the thousands of residents who moved away, even if some of those new residents are (God forbid) “hipsters” who come from more affluent backgrounds. I’m pretty sure that the residents moving into new apartment projects along the Troost corridor are not displacing anyone. They are moving into new housing units mostly built on vacant lots. The economically distressed areas of the city’s East Side are full of thousands of abandoned houses, which are now attracting investors to renovate them — and in the process delivering more affordable housing options. Jason Segedy, director of planning and urban development for the city of Akron, Ohio, notes that the problem with economically distressed areas is not inequality. The problem is poverty. Too many residents are equally poor. By introducing a more diverse socioeconomic population, a rising tide will lift all boats. Higher population leads to healthier businesses, schools, churches and a stronger community overall. Remember, we closed more than 20 schools in the Kansas City Public Schools district over the past decade. Imagine what a few thousand new residents could do for our schools. My observation is that both the developers and their residents along this new urban frontier are keenly sensitive to the cultural legacy of Kansas City’s East Side, which must not only be respected but celebrated. Rather than disparaging the economic progress along Troost, we should encourage its continuation and make Kansas City a model for American urban renewal. Gib Kerr is a commercial real estate broker focusing on investment sales, with an emphasis on development transactions in Downtown Kansas City. He served as co-chair of the sell-out Downtown Office Summit meeting for the Downtown Council in October at Crown Center. The Downtown Council and the Community Improvement Districts have kicked off the annual Toy & Coat Drive to benefit the men, women and children served by the Downtown Community Services Center. This is your opportunity to fill the barrels (several of them!) with new or gently used toys and clothing/coats for those in need in Downtown Kansas City. Collection barrels will be accepting donations at the Downtown Council office, 1000 Walnut, Suite 200 now through Dec. 21. All donations will be distributed to friends and clients at the Downtown Community Services Center before Christmas. 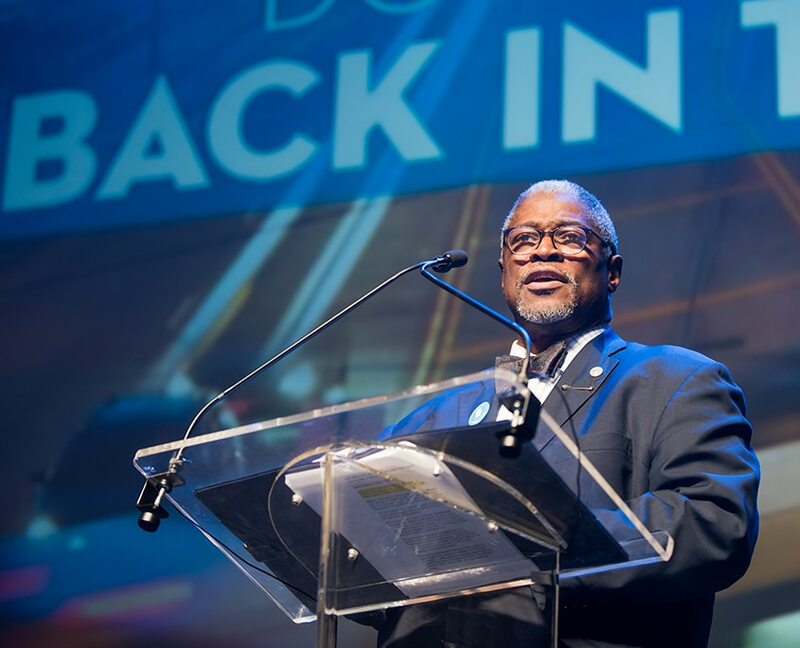 Kansas City Mayor Sly James addressed the 2018 Downtown Council Annual Luncheon full house audience early this year. Downtown Kansas City’s ascension to becoming the region’s leading destination for conventions, visitors, and business and leisure travelers will be the main course of the next Downtown Council’s Annual Luncheon on Thursday, Jan. 24, 2019 at the Kansas City Convention Center. “Today, Kansas City can be said to have actually achieved the elusive dream of scores of proud old American cities that have seen better days: It has a revised downtown, which now skews closer to “bustling” than “desolate” many nights,” The New York Times reported in July. The Downtown Council’s annual event – this year, Destination Downtown KC – will illustrate Downtown’s miraculous renaissance that is attracting meetings, residents, visitors, employers, workers and riders to a thriving arts, cultural and business scene. Downtown’s emerging role as a leading destination was underscored this week, when National Geographic Traveler selected Kansas City, Mo. as the only U.S. city or destination on its listing of 28 Best Trips Around the World in the December/January edition. Jonathan Tisch, Chairman & CEO of New York-based Loews Hotels & Co., will deliver the keynote address at the Downtown Council Annual Luncheon next month. The Destination theme also serves as a platform to showcase an urban hotel boom that is currently unfolding in Downtown, including a 200 percent increase in hotels (from eight in 2015 to 24 by 2020) and an 85 percent increase in rooms (from 3,414 to 6,415), including the $325 million Loews Kansas City Hotel that will open 800 new convention hotel rooms in two years. The keynote address will be delivered by Jonathan Tisch, Chairman & CEO of New York-based Loews Hotels & Co. Tisch joined city leaders in August, at the official groundbreaking ceremony for the convention hotel. 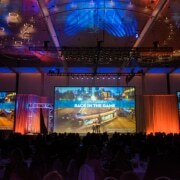 Destination Downtown KC is expected to attract about 1,000 business, civic and philanthropic leaders to celebrate progress and accomplishments; present awards; assess the trajectory of Downtown Kansas City for the long-term; and, embraces the largest urban networking event of the year. The luncheon is set for 11 a.m. to 1:30 p.m. on Jan. 24 in the Kay Barnes Ballroom. Keynote speaker Jonathan Tisch, Chairman & CEO of Loews Hotels & Co., will identify the challenges to maintain or even accelerate the growth of Downtown, and then discuss the challenges ahead. The Annual Luncheon will feature three honorary co-chairs, including Tim Dunn, Chief Investment & Treasury Officer, JE Dunn Construction; Jeffrey J. Jones II, President & CEO of H&R Block; and Brenda Tinnen, Senior Vice President/General Manager, Sprint Center. Luncheon planning chairs are Jerry Riffel, Attorney, Lathrop Gage, who also currently chairs the Downtown Council; Julie Pierce, Vice President / Director of Kansas City Operations, Henderson Engineers; and Nate Orr, Partner, Spencer Fane. To reserve your space at the luncheon, visit https://www.downtownkc.org/2019-luncheon/ or contact Ann Holliday, ann@downtownkc.org, or Ashley Broockerd, abroockerd@evenergy.com. The Downtown YMCA/Kirk Family Community Center will celebrate the beginning of construction of the former Lyric Theatre building on Friday. The YMCA of Greater Kansas City will host a Construction Kickoff Celebration for the new Downtown YMCA/Kirk Family Community Center this Friday. Donors, volunteers, members and the community are invited to gather at a special celebration at 11:15 a.m. Friday on the front steps of the former Lyric Theatre building at 1029 Central St. The event will include a ceremony to commemorate the redevelopment of the 92-year-old building and illustrate bringing healthy living, youth and community programs to Downtown Kansas City. The new Y will bring important programs to the families and commuters in the heart of Downtown for the first time, including a medical clinic, swim lessons, healthy living classes for children and adults, community events, and opportunities for people of all ages to improve quality of life. The Downtown Council honors Kirk’s strength and leadership each year by awarding its Philip J. Kirk Jr. Award to a community leader in recognition of community vision and Downtown stewardship. The Kirk Award will be presented to former Mayor Kay Barnes at the next DTC Annual Luncheon on Thursday, Jan. 24, 2019. Other donors to the Downtown Y/Kirk Family Community Center include the Sunderland Foundation; Tom and Jean McDonnell; Illig Family Foundation; William T. Kemper Foundation, Commerce Bank, Trustee; The Kirk Foundation Trust; SS&C Technologies; Victor Speas Foundation, US Trust, Bank of America Corporation; Gary Dickinson Family Charitable Foundation; Kansas City Southern; Mabee Foundation; Dunn Family Foundation; UMB Trusts & Foundations: Arvin Gottlieb Charitable Foundation; Jim and Annabelle Nutter Family; Sherman Foundation; KCP&L; Frank and Nancy Kirk; Mark One Electric; Tom and Jill McGee; Natalie Kirk Welch and J.C. Welch; Allen and Libby Blair; Charles and Judy Kahn; and Ron and Nancy Jones. The YMCA and Truman Medical Center will team up to offer a medical clinic at the Downtown Y. The two organizations first partnered to open TMC’s University Health Clinic adjoining the Linwood YMCA/James B. Nutter, Sr. Community Center in February 2018. The Linwood Y partnership has already proven that working together toward a common vision and mission can improve community health at a time when chronic disease is rising and access to quality health care remains a challenge for many. The Downtown clinic will make health care more accessible to Y members, as well as those in the surrounding area. “Bringing this Y and medical clinic to Downtown is truly a game changer and an important milestone for the Kansas City community,” said CiCi Rojas, chief volunteer officer for the YMCA of Greater Kansas City. Development partners include Broadway Square Partners, the Downtown Council and MC Realty. To read more about the Downtown Y/Kirk Community Center announcement, visit CityScene KC. The National WWI Museum and Memorial will continue to capture the world’s attention this weekend with a flurry of activities to commemorate the centennial of the World War I Armistice on Sunday. Highlights include Peace and Remembrance, the spectacular illumination of America’s official World War I Memorial that began last Friday and continues through Armistice Day on Sunday in recognition of the 9 million soldiers who made the ultimate sacrifice during the Great War. 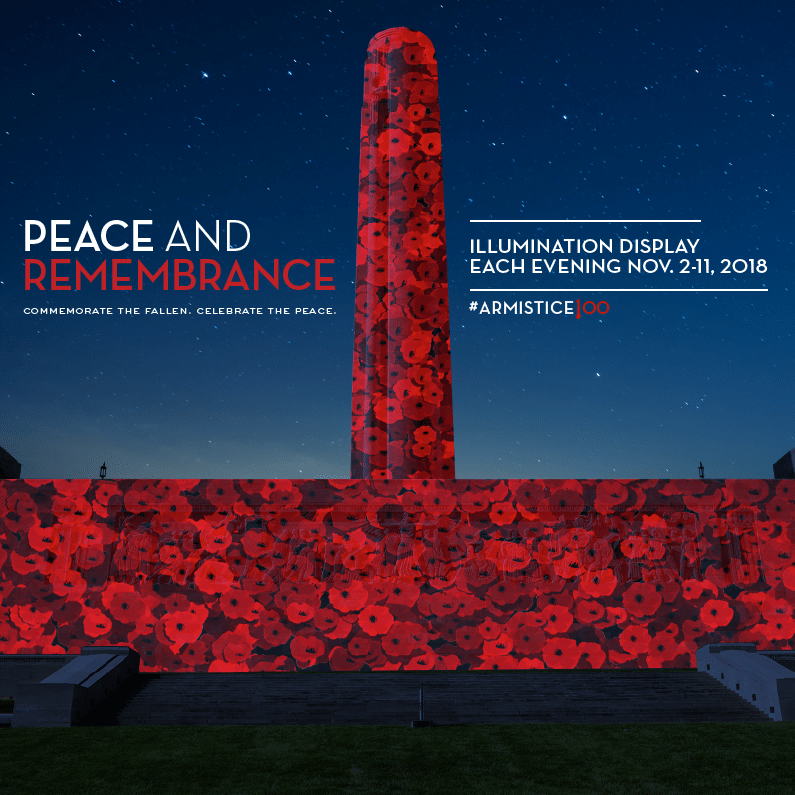 Comprised of nearly 55 million pixels to cover the Memorial with red poppies – a traditional symbol for commemorating military personnel who died inspired by the World War I poem “In Flanders Field.” Peace and Remembrance is viewable from a significant distance. From today (Friday) through Sunday, admission to the Museum and Memorial is free for veterans and active-duty military personnel; general admission for the public is half-price. On Sunday, Nov. 11, the multi-national Armistice Commemoration Ceremony will begin at 9:30 a.m. in the Museum’s Memorial Courtyard. Free to the public, this special ceremony features moving readings of letters from soldiers, poetry, musical performances and more. What: Artist Ada Koch’s moving installation features 117 intricate metal poppy sculptures in a symbolic arrangement. Each poppy represents 1,000 American soldiers killed during the Great War. What: The official WWI Memorial of the United States will be illuminated with a nearly 55 million pixel, 800,000 lumens display featuring more than 5,000 poppies each evening with a massive and moving light installation. 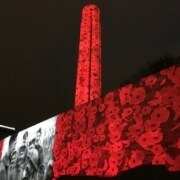 Every 15 minutes, special presentations of images, footage and details about World War I will appear. The public is welcome to view the illumination from the grounds of the Museum and Memorial with the North Lawn being the best viewing location. Parking is available in the Museum and Memorial lots as well as along Kessler Road. In the event of inclement weather, the illumination will pause until the weather clears. What: Find your connection to World War I during Memorial Day weekend through research stations. With access to multiple databases including, Fold3.com, Ancestry.com, the Museum and Memorial’s online collections database, the American Battlefield Monuments Commission and the National Archives, discover how the Great War affected your family through records, photographs and much more. FREE to the public. What:Commemorate the Armistice by creating your own felt poppy pin or ornament in this family-friendly craft experience. FREE to the public. What: Join us for a commemoration of the Armistice of 1918 featuring representatives from more than 10 nations around the world, moving readings of poems and letters from soldiers, musical performances and more. FREE to the public. What: Exactly 100 years after fighting ceased in Europe, organizations across the globe participate in a traditional bell tolling to commemorate this momentous event. Those unable to attend the ceremony are also invited to toll bells at 11 a.m. on Nov. 11 to honor those who served. Collectively, the sound of bells represent this incredible moment of peace. The bell used for this ceremony was originally located at one of the federal buildings in downtown Kansas City and was rung daily by the Daughters of the American Revolution during U.S. involvement in WWI (1917-1918). It was also tolled 11 times at 11 a.m. on Nov. 11, 1926 during the dedication ceremony of the Liberty Memorial.FREE to the public. What: More than 100 new Walk of Honor granite bricks will be dedicated during a special ceremony. The Walk of Honor, now more than 11,000 bricks strong, is divided into three sections: bricks dedicated solely to those who served in World War I; bricks dedicated to veterans of any military service; and bricks that honor civilian friends, family or organizations. Walk of Honor bricks are dedicated twice each year during Memorial Day and Veterans Day ceremonies. FREE to the public. What: Hailed as “remarkably prescient” by the New York Times, this special exhibition examines the American Jewish battlefield and homefront participation through a series of remarkable stories and objects. Featured items including Irving Berlin’s draft registration card and the handwritten draft of the Balfour Declaration, which eventually paved the way for the establishment of the Jewish state. Closes Sunday, Nov. 11. What: Australian and American troops fought side-by-side for the first time in July 1918 during World War I. Since then, the Diggers (Australians) and Doughboys (Americans) supported each other in every major military conflict, including Korea, Vietnam, Iraq and Afghanistan. This exhibition features incredible artwork from the Australian War Memorial Collection illustrating the unique comradeship between the two countries. What: The World Remembers is an international education project whose purpose is to remember and honor these combatants who perished during each year of the war by displaying their names in more than 75 locations throughout Europe and North America for a period of eight weeks ending with the Western Front Armistice Day of Nov. 11. Closes Sunday, Nov. 11. What: Creating art when surrounded by war seems contradictory. Artists Jean Lefort, Curtiney George Foote, Charles Thatcher Shellabarger, Myron Chapin and Jean Berne-Bellecour demonstrate several ways one can capture wartime experiences using the fields, villages, and people who witnessed the devastation of WWI. Closes Jan. 13, 2019. What: For the Doughboys on the Western Front, 1918 was their year. It was the crucible where the American land forces forged their fighting force. They fought alongside their main allies from Cantigny to Belleau Wood to the Champagne Region, the Piave River to the Marne to St. Mihiel to the Meuse Argonne to Vladivostok. This exhibition is not an illustration or timeline of how the 1918 battles were fought, rather it focuses on individuals and their lives and deaths in the crucible of 1918. Closes March 10, 2019. The National WWI Museum and Memorial will be open from 10 a.m. – 5 p.m. Friday-Saturday and from 9 a.m. – 5 p.m. on Sunday. To accommodate expected high Armistice Day Weekend attendance, additional parking will be available on the Southeast lawn of the complex (weather permitting). The Downtown Council supports new funding for safer roads and bridges in Missouri, and encourages a YES vote on Prop D. The election is set for Tuesday, Nov. 6. Prop D is a statutory change allowing a 2.5-cent tax increase on gas and diesel annually for four years, resulting in an overall dime-per-gallon motor fuels tax increase. The new funding will provide money to be spent on construction and maintaining safe highways and bridges. Today’s blog – written by Downtown Council board member Warren Erdman – is designed to explain why the DTC Board of Directors voted to support Prop D in this important election. Vote YES for safer roads and safer streets on Nov. 6. Proposition D on the November 6 ballot is vitally important to Kansas City and to Missouri. It would raise the motor fuels tax in Missouri by 2.5 cents per year for four years, and make over $400 million a year available for state and local roads and bridges across Missouri, including $55.3 million in state funds for transportation projects in the Kansas City region and $14 million for local county and municipality transportation projects in our area. Over its four-year phase-in and when fully implemented, the extra 10 cents per gallon will help fix our roads and bridges, create jobs and pump hundreds of millions of dollars into our local communities for roads and bridges. The new money will allow Missouri to move to the front of the line to return federal tax money we have already paid to Washington, to fix our roads and bridges back home. If we don’t provide the matching money, other states will and receive our money. Missouri hasn’t raised our state motor fuels user tax since 1996. Inflation has eaten away at this 17 cents tax, which only has 7 cents of purchasing power today. While steel, concrete and asphalt have doubled and tripled in cost over the last 22 years, the state motor fuels user tax has lost 60 percent of its value. MoDOT has cut overhead spending and has its house in order. Its leadership is committed to prudent stewardship of this constitutionally protected, regularly audited road and bridge money. This infrastructure funding is badly needed in Missouri and the Greater Kansas City region to address our transportation infrastructure, highways and bridges. Missouri Governor Parson, Lieutenant Governor Kehoe and other state leaders across Missouri strongly support this modest, overdue initiative for our highways and bridges. Kansas City needs to do its part to help pass Proposition D this November. Please join me in voting YES on Proposition D on November 6. The Box Gallery is taking a creative turn with its new exhibition – Ekphrasis – that opens on Friday in the Commerce Arcade, 1000 Walnut. The title of the exhibit was inspired by the Greek word, Ekphrasis, defined as a literary description of, or commentary on, a visual work of art. The exhibit’s goal is to bring together regional artists and writers and challenge them to create new visual or literary art inspired by a specific work. The free exhibit goes on display Friday, Nov. 2 and continues through Jan. 24, 2019. And, the public is invited to a free, opening reception is set for 6-8 p.m. Friday. Some 20 writers and 20 artists from Missouri and Kansas were invited, via a jury process, to be part of the exhibit and to create a new work of art or writing inspired by one of the other’s original submissions. For example, a poet is given a painting and asked to use it as inspiration to write a new poem, while a painter or sculptor is given a poem and asked to use it as inspiration to create a new artwork. Each artist and writer was blindly assigned to another person’s work. Neither the artists nor the writers know with whom they have been paired and will meet for the first time at the opening reception, when the exhibit reveals how each read the other’s work. The show at The Box Gallery will consist of 40 works, made up of 20 pairs encompassing poetry, prose and visual art in a range of media. The exhibit is organized and curated by Diana Moxon, owner of Yocto Arts, LLC. Moxon was the executive director of the Columbia Art League for 11 years and brought the exhibition concept to KC after successfully hosting a similar exhibit, entitled ‘Interpretations’ in Columbia, Missouri. “We had 68 artists and 65 writers submit work to be considered for this exhibit. Our two panels of jurors had a challenging time selecting only 20 of each for the show. It is evidence that there is a deep pool of talent here in the Midwest,” Moxon stated. The Box Gallery is located in the Commerce Bank Building, 1000 Walnut, Suite 211. It is always free and open to the public Monday-Friday 8:00am- 8:00pm. Free parking validation is available at the security office. The Downtown Council supports the Kansas City Public Library’s campaign for voters to authorize an 8-cent increase in the property tax based operating levy – the first such request in 22 years – to maintain and modernize facilities and sustain and enhance essential services. The election is set for Tuesday, Nov. 6. Today’s blog post is designed to explain the challenges faced by our libraries and why the DTC Board of Directors voted to support the Kansas City Public Library in this important election. Vote YES for your libraries on Nov. 6. Single and a mother of four, working but apprehensive about her prospects of moving up, Theresa Hill set her sights at age 36 on getting the high school diploma she didn’t have. It wouldn’t be easy. Too many alternative programs didn’t fit her work- and kid-packed schedule. Hill managed to complete one course of study, only to discover it wasn’t accredited. She finally found an answer at the Kansas City Public Library, one of a number of libraries nationwide offering free enrollment in the flexible, self-paced Career Online High School. Hill looked into it, and “I just knew that this was the best fit for me,” she says. She’s now advancing toward a diploma, with plans to move on to college. She underscores the far-reaching role that the Library plays in the community – and the reason it is asking voters next week for an 8-cent increase in its property tax-based levy. The Library’s menu of programs and services, and public demand for­ them, continue to expand. Revenues have not. Walk through any of the Kansas City Public Library’s 10 locations and, yes, you’ll see patrons browsing stacks of books and picking the brains of reference librarians. Traditional stuff, and still essential. But you’ll find many others searching for work on Library computers or using the Downtown Central Library’s business center to plot a startup. Students get live online help with homework. Residents near L.H. Bluford Branch at 31st and Prospect sweat through fitness classes. Outreach librarians fan out to preschools, childcare centers and senior living communities. The Library last year offered more than 31,000 classes, peer learning groups and other training sessions to help people enhance their computer skills. Its evening speaking presentations, civic forums and other signature events, plus a rotation of exhibits through its two art galleries, drew nearly 103,000 attendees and visitors. All told, it counted more than 4 million in-person and digital visits. Meanwhile, the Library levy has remained unchanged for more than two decades. The approved rate of 50 cents per $100 of assessed valuation was approved in 1996, and Missouri’s Hancock Amendment has nudged that downward year to year. Tax increment financing and other abatements in Kansas City have cut deeper: approximately $30 million over the past decade. The proposed levy increase would just about cover that latter bite, generating an additional $2.8 million annually. Approval of the November 6 measure would allow the Library to meet the growing demand for its services, as well as take care of facilities that are largely a quarter of a century old and behind on maintenance and renovation. Without the levy increase, Library Director Crosby Kemper says it will have to make some difficult decisions potentially affecting the level of services and maintenance of facilities. The Kansas City Star has endorsed the proposed increase, calling it “long overdue.” Kemper notes, too, that the Library levy is not a single-use tax. It’s applied to a wide array of needs, touching a significant number of lives in the community. And the increase would be a modest one. For the owner of a home with a market value of $139,000 – roughly the median in Kansas City – an 8-cent levy increase would mean an additional $1.76 a month in property taxes. The owner of a $75,000 home would pay less than an additional dollar a month.